I just realized as I was putting my collage together, that this is almost a kid-free week! 162: Onions growing in our garden. 163: Bug in the pink flowers beside my house. 165: We picked up our fresh packaged chicken! Home-raised chicken tastes so much better than store-bought. Yum. 166: My kids call this a “penguin” caterpillar – see the little penguins on it’s back? 167: Went out to take pics after some rain. 168: Fresh berries from our strawberry patch. And that’s a peek at life by the creek! 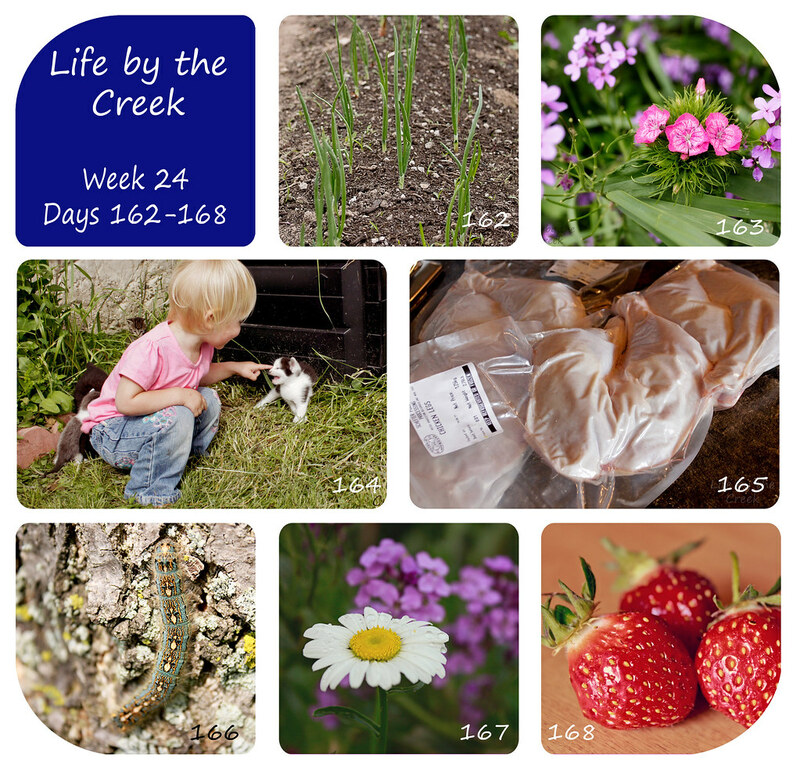 Visit Sarah to check out more 365 projects. WOW!! Awesome photos. Love the flowers, caterpillar and strawberries. I guess I love them all. Ha ha. Thanks for linking up. Have a great Sunday. The kitten- oh how I LOVE the kitten! all great shots!! the caterpillar is soo cool! Love the caterpillar and kitten. You're right home-raised chicken is so much tastier.